Recently, there is been a lot of talking about weight cutting among the UFC fans. 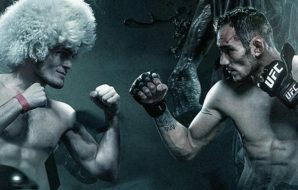 One of the fighters whose name often comes up on the topic of cutting weight is the UFC Lightweight champion Khabib Nurmagomedov (check out these 10 interesting facts about Khabib). Here, in this article, you’ll find out some secrets on how much weight Khabib cuts before the fight, his diet, and what is his normal weight between the fights. Does Khabib cut more weight than the other UFC fighters? Like I mentioned earlier, a lot of MMA fans complaint that Khabib cuts a lot of weight, gets an advantage by doing so, and that he should move division up to the Middleweight. Fair enough, but does he actually cuts that much weight, more than other guys who fight at 155 lbs? Definitely not. Among the current UFC Lightweights, Tony Ferguson and Kevin Lee are also cutting a lot of weight. Khabib is not the biggest guy in the division and weight advantage is not the only reason why he is unbeatable. A key to success with cutting weight is not only to be bigger but also be able to recover conditions prior to the bout, retain strength, agility, and endurance. 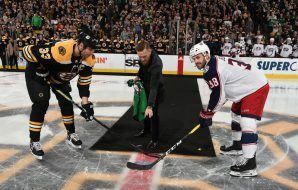 Some other UFC fighters also have a history of massive weight cut: like Darren Till, Max Holloway or Conor McGregor when he fought in the Featherweight. 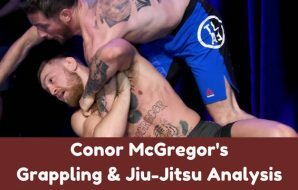 While fighting in the Featherweight, McGregor looked a lot bigger than his opponents on a fight day. Not many of you complained then, did you? 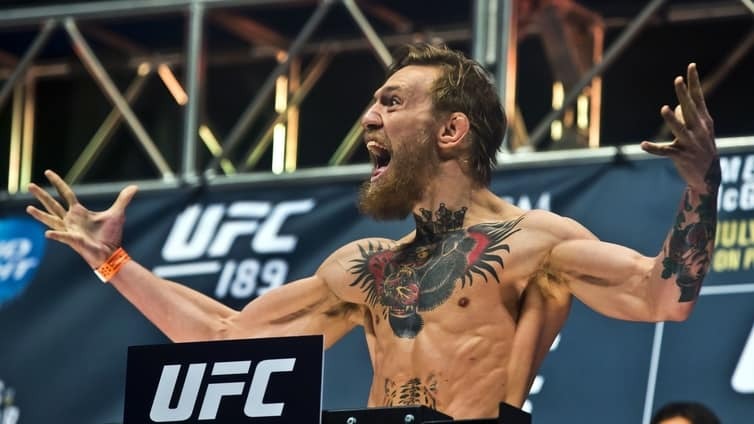 Conor McGregor had massive weight cuts when he fought at 145 lbs. At the time, he was one of the biggest guys in the division. My opinion on this subject is that there are rules which are set by the organization. I don’t see it as a problem as long as fighters play by the rules and they are the same for everyone. Everyone is in the same boat. They are currently doing weights a day prior to the fight and I don’t see it being a problem if a fighter takes an advantage of it. A different story if a fighter has a history of not making weight more than once or had multiple health issues/problems because of it. In this case, I feel it’ll be fair for UFC to make an athlete move up to the next division. For example, if Till didn’t make weight twice in a row I think it would be fair to not let him fight in the Middleweight again. Or, if Khabib were to pull out again because of the health issues while cutting weight – it would be a good reason as well. Khabib Nurmagomedov had 2 incidents with weight in the UFC. At the UFC 160 tournament, his 4th UFC fight (against Abel Trujillo), Khabib didn’t make weight – he was 2.5 pounds over the lightweight limit. Nurmagomedov was given 2 hours for the last-minute cut which he didn’t attempt. Khabib was fined 20% of his purse for being overweight. 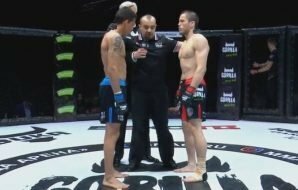 In the end, “The Eagle” left no chances for Trujillo and got an easy decision win. 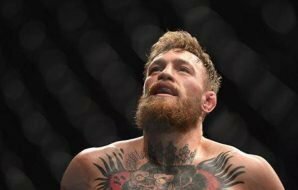 The second accident is well-known to many of you; it happened in 2017 prior to the UFC 209 bout with Tony Ferguson. Nurmagomedov was hospitalized when he was in the process of cutting weight a night before weigh-ins. Khabib passed out in his hotel room with severe dehydration and kidney problems. Medics had to use the IV and ruled him out of the contest. 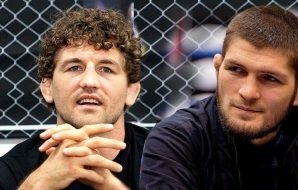 According to Nurmagomedov itself, he doesn’t have problems with weight cuts when he is healthy: “My number one enemy is injuries because I train so hard. When I’m healthy, I always make weight”. People from Khabib’s team were saying that they made some mistakes in the way they were preparing for that bout with Ferguson. Since then, Khabib fought twice with Edson Barboza and Al Iaquinta. He made weight both times with no problems and it seems that Nurmagomedov is been keeping his weight lower during training camps. 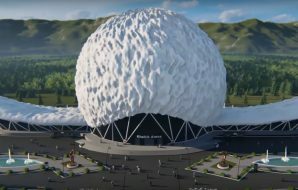 How much does Khabib really weigh? 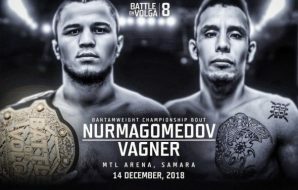 Nurmagomedov is fighting in the Lightweight division at 155 lbs (70.45 kg) limit – it is how much he weighs at the official weigh-ins a day prior to the fight. The question is, how much does Khabib Nurmagomedov really weigh between fights, during training periods and on the fight day itself? Khabib Nurmagomedov was 154.5 lbs at weigh-ins when he fought vs Al Iaquinta. 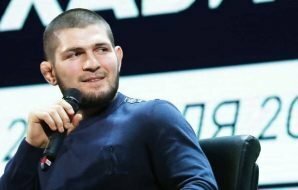 It’s not really a secret: Khabib himself, as well as his father and coach Abdulmanap Nurmagomedov, openly talk about his weight. During time-off, Khabib weighs about 85 kg (187 lbs). Then, in the training camp, as he is preparing for the fight, he weighs between 79.5 kg – 81 kg (79.5 kg or 175 pounds is the optimal weight for Khabib according to his father). About a week from weigh-ins he starts to cut weight: down to 78 kg (172 lbs) 6 days before weigh-ins, then down to 76.5 kg (168 lbs) 5 days before and etc. until he is at 70.45 kg (155 lbs) for weigh-ins. Nurmagomedov and most MMA fighters say that the last few pounds are always the hardest to lose. 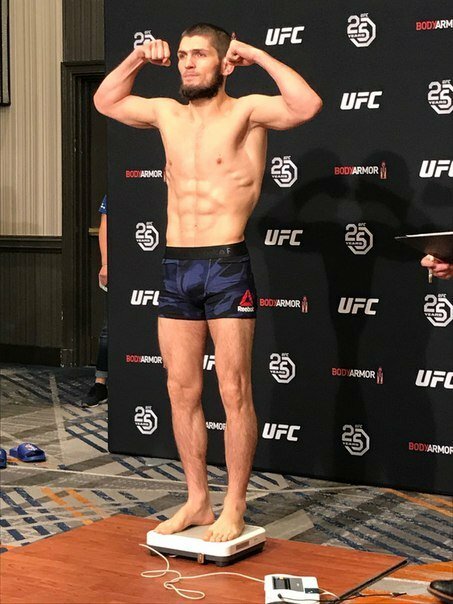 After weigh-ins, Khabib gains everything back and stands in the Octagon somewhere around 176 lbs or 80 kg mark. It’s normal and not unusual situation in the MMA world: Anderson Silva used to gain about 25 lbs after weigh-ins, Georges St Pierre – 20 lbs. If we look at the Lightweight division, Tony Ferguson’s weight cuts are similar to Nurmagomedov’s. Is there any secret about Nurmagomedov’s weight cutting process? Not really, the process of cutting weight is pretty straightforward and Khabib uses the same strategy as most combat athletes. It’s all about manipulating your water and sodium levels and decreasing water consumption. “The Eagle” drinks 8 liters of water a day for a week prior to the contest and stops water consumption a day before weigh-ins (he losses about 4 kg by doing so). He uses a sauna and runs on a treadmill to cut the last few pounds. His diet during the weight cut process consists of tiramisu lots of fresh salads, fruits, and fish for protein. Right after weigh-ins, to recover, Khabib has plenty of water, 300 grams of honey, dried dates (they are high in calories and very nutritional), and bananas. A little bit later – beef brisket, chicken and chicken broth. 4 hours after the meal he goes to the last practice before the fight. After that, in the evening, Khabib drinks black tea with lemon and has lots of salad/fresh vegetables. Later, he wakes up in the middle of the night at 2 am to drink 1.5 liters of water. With this diet, Khabib is getting back everything that he lost while cutting weight. 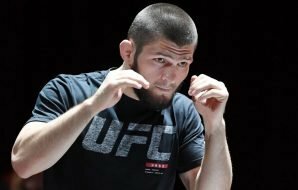 There is not much of a secret after all – the way Khabib cuts weight is very similar to how most UFC fighters do it. In the end, I have to put my word in on tiramisu topic. Come on, people, this guy doesn’t drink, doesn’t smoke, he is extremely disciplined and professional. 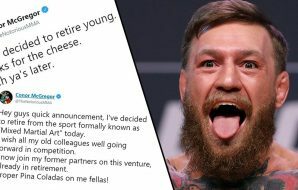 Do you really think he would eat tiramisu while cutting weight before a very important fight? The weight cut is part of the MMA business. Like it or not.